Greasy spoon cafe on London Road in Croydon, near West Croydon Station. 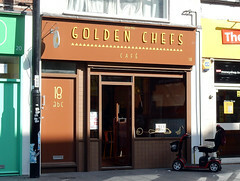 It was previously called Golden Chef's Grill photo, but changed its name to Golden Chefs Cafe in 2015 when it got a council-funded refurb of the shopfront. It's quite nice inside, with booth-like seating covered in interesting colours including light purple. They have a few highchairs for children too. Orders are taken at the table, and you pay at the register before leaving, though we got the impression that they'd be happy to let you pay your bill at the table if you want. Like most greasy spoons, they have a number of set breakfasts but also let you construct your own from individually-priced components. They do pancakes too (though we haven't tried these yet). Kake visited twice in December 2011, once in the company of Alice and once in the company of bob. Heart radio was playing during our visits, not overly loud. We tried the fried breakfasts photo both times. On our first visit, Kake's fried egg had a completely set yolk, which was disappointing, but on our second, the fried eggs on bob's plate had nicely runny yolks (we weren't asked either time how we'd prefer them). Mushrooms were nicely done on both occasions; not soggy at all, and with a nice amount of browning photo. A cup of tea ordered as "very weak tea" arrived with the teabag still concealed in the bottom of the mug, which wasn't quite what we'd asked for (this was rectified on later visits). A bottle of still water came with an ice-filled glass and a straw, which was a nice touch. On a Thursday lunchtime in November 2018, Kake's fried egg sandwich was very good, including two eggs served with runny yolks (they offered me a choice of well-fried or soft) in bloomer-style brown bread with a good chew on the crust. Along with a cup of tea this came to £3.15. Accessibility: A small step (kerb-height) to get in, then a shallow ramp. Toilets are down a narrow corridor. The tables are not fixed, but are a little heavy to move if you need more room. Last visited by Kake, January 2019. Opening hours taken from menu, January 2019. Last edited 2019-01-03 14:27:39 (version 9; diff). List all versions. Page last edited 2019-01-03 14:27:39 (version 9).